09/22/18--07:45: The Environment Agency, Green Horizons Contractors, and vole-friendly maintenance: a story of good communications. Water courses can be cleared to minimise flood risk without harming water voles or their cover. 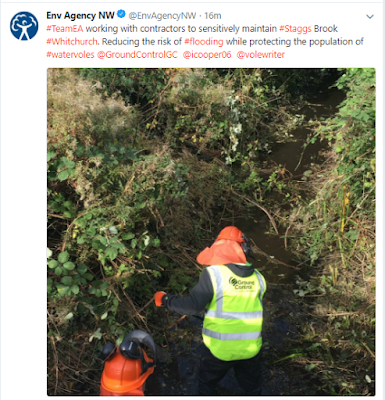 The EA not only contacted the Whitchurch Water Vole Group prior to their work to check we thought it was OK for the voles, but sent us regular updates via social media. A friend of mine who lives locally says she saw even one of the men sitting reading a book about water voles during his break. So many thanks to them, and to Green Horizons contractors. I went down last night and saw this vole above happily eating, and swimming up and down the newly-strimmed banks, still with plenty of cover to hide in. Water vole prints, plus a single dropping. This water vole dived repeatedly to pull up orange roots. This photo shows how brown a water vole's fur can look. I'm seeing a couple of voles at a time down at White Lion Meadow. They're very often to be found clambering around in the brambles and willow herb. These are all White Lion Meadow voles seen this month. There are at least three individuals operating on this stretch, all busily eating to pile on the weight for winter. I don't suppose they'll be visible for long now: soon they'll retire below ground to wait out the colder weather. I haven't seen a water vole for a couple of weeks now, so I'm assuming they've taken themselves underground in the main, ready for the colder weather. This is the time sightings usually stop, although I have occasionally seen them in November. I'd hope next year's sightings to be starting around mid-February or March. However, you can still see their little starry pawprints down at White Lion Meadow (the car park by Tesco), so there must be some above-ground activity. Below, starry water vole footprints at White Lion Meadow. And here's the first vole of 2019, at White Lion Meadow. Today this blog remembers the very wonderful Anne Monie and all she did for voles, and all the kind and generous things she did for the community. Very much missed. This vole is eating spiny bramble stalks, apparently without any difficulty. Below: some subtle signs of water vole presence at the Timber Yard. Below: lots of burrows at Edward German Drive an unusually long way away from the water course. About this time of year, water voles enjoy catkins laden with pollen; I think this is for the protein they offer. This vole at the bottom seems to have a particularly dense and fuzzy coat suggesting it's in good condition and ready for breeding. 04/07/19--11:58: And now the first vole at Edgeley Road. Two sparrowhawks that visited my garden today. Moss Field is behind the Saddler's Walk estate, land that's soon to be developed, so we need to keep our eye on that. The ditch, which is L-shaped, maintains a steady population of water voles even when the water dries up, and happens some years. It's hard to get to once the vegetation has grown up, so it's good to get a survey in now. All the key field signs are in place that mean definite (and busy) water vole presence. Is there a white spot on this vole's forehead? Below, Black Park Road and water vole signs there. And lastly, these signs below are at the ditch in Broughall. I had the pleasure of meeting someone from Cheshire Wildlife Trust today to give them some in-the-field experience of assessing water vole habitat and occupation. We looked at two sites and examined burrows, droppings, latrines, feeding and feeding stations - and we actually saw a vole too. I am always happy to take out individuals or small groups, whether it's enthusiastic amateurs, volunteers or professional ecologists. I've worked for the Field Studies Council and for the Wildlife Trust and I have hundreds of hours' experience. Please do contact me via Twitter or Facebook if you'd like some practical training.